Toy companies are so busy at the moment, cashing-in on their past products by refreshing old lines or remaking them entirely, that I’m starting to wonder what will actually be considered “retro” in the future. If there are fewer “original hits” today, will the nostalgia of tomorrow increasingly feel like a cascade of products that traces it’s roots back to the 1960s, 70s and 80s? 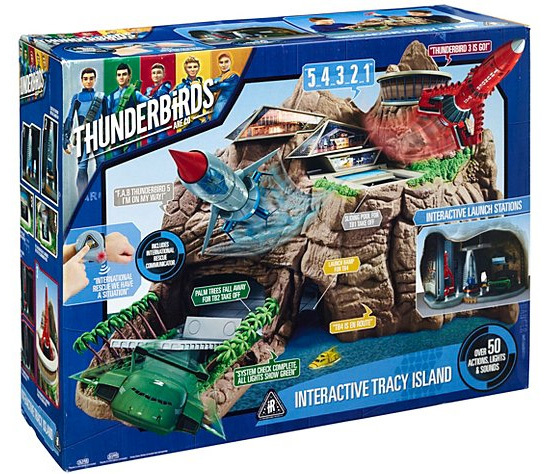 The Thunderbirds are one of many retro brands with a new range of toys currently in stores. Perhaps this is already happening. I recently noticed that the toy section of one major store here in Australia had so much space devoted to Star Wars, Teenage Mutant Ninja Turtles, My Little Pony, Transformers and The Thunderbirds, that if you removed those lines, at least a quarter of their toy department would disappear. If you can find a hobby or toy shop that still stocks Tamiya R/C models these days, you’ll probably notice that their remake 1980s kits make up a similarly large proportion of the total Tamiya vehicles on offer. In a quick survey of Sydney’s Hobbyco hobby store, of the 33 Tamiya R/C cars listed on their website, 7 (21%) are currently remakes of models they had in the 1980s. Elsewhere the figure is often higher – of the 12 Tamiya buggies currently listed on another hobby store’s website, 10 are remakes of models from the 1980s. That’s 83%. So let’s widen the scope to look at all toys, at a random mainstream retailer. What happens when we compare the range of toys stocked in the 1980s, with today, and see what proportion of toys from each era could be considered “retro” in their day? In Australia, we have a department store known as Myer. Back in the 1980s, these stores were known as either Myer or Grace Bros in various Australian states. They have always had a toy department. 100% of those toy lines are “of their time” – either they were introduced in the 1980s, or were experiencing ongoing popularity at that time. You could argue that model trains and slot cars had already been around for decades beforehand. But their nature was more that of a category, than a retro brand attempting to tap into nostalgia. People didn’t buy slot cars and trains in the 1980s out of some retro nostalgia – they just bought them because they were still fun. From the first page, featuring kids in costumes from comic book superheroes that date back to the 1940s, it’s a very different picture. There’s a huge amount of retro stuff. After three pages devoted to vintage superheroes, page four is all about Star Wars – the biggest late-1970s/80s toy brand of them all. Page five features that revival of The Thunderbirds I mentioned earlier (The Thunderbirds were regularly aired on TV from the 1960s to the 1980s) and of course Transformers (another behemoth of toys in the 1980s). After that we see toys from The Jungle Book (I saw this at the cinema in 1986), along with a variety of Disney princess dolls relating to films up to 100 years old, from Snow White to The Little Mermaid. Then there’s Sylvanian Families (released in 1985), Barbie (which dates back to the 1960s) and Thomas the Tank Engine (originally a series of books, but which became a hit toy line in the 1980s). If there are any new hit toy lines in the catalogue at all, they might be Disney’s Frozen, and Shopkins – both of which launched in 2013. But they are clearly being dwarfed by the nostalgia lines. The point is that a huge amount of what’s around today, is retro. And while obviously a lot of it is designed for kids to play with, there are also a lot of products that aren’t really aimed at kids at all. Toy remakes and relaunches are often an obvious and cost-effective way for toy companies to make money without the need for too much design or development, let alone the creation of new molds or other expensive manufacturing equipment. It’s also a practice that has been going on for years. But it wasn’t always done in quite the same way, or for the same reasons, as it is today. During the 1950s, 60s, and 70s there were toys that were discontinued and later revived. But this was usually to give them a product refresh or makeover. And while these makeovers continue today, many toys with ties to the past are also being re-marketed toward a new category of consumer that has only really emerged in recent decades – the adult collector. Since the 1990s, “collector’s edition” and “limited edition” have been common language used on a lot of toys. But most toys with this type of marketing have gained little or no collectible value at all. Since the 1990s, toy companies have become all too aware of the power of adult nostalgia in the selling of toys. This is why many products began to be sold as “collector’s editions” and “limited editions” in the 90s – something we rarely saw beforehand. Today, serious toy collectors are everywhere. I have some “Google alerts” set-up, and almost every day there’s an article published on some news site somewhere in the world about a vintage toy fair, a new vintage toy shop, or just toy collectors in general. Despite the general consensus being that overall toy industry sales are not what they used to be, it seems that demand from collectors may also be having an impact. On the one hand, we often hear that “kids these days” do not seem to play with traditional toys as much as they used to. In a recent talkback radio discussion I was listening to, a school teacher described how playground behaviour had changed in recent years thanks to iPads and phones. Apparently, many children now sit huddled together in groups staring at digital screens during the breaks, while the old school-yard games we 30-somethings used to love (for me it was anything from tag to handball, or simply running around with a Transformer or Star Wars figure in your hand and yelling “pew pew!”), are in heavy decline. But on the other hand, in January this year, figures were released suggesting 2015 was quite a decent year for the US toy industry, with an increase in sales of nearly 7%. While the long-term sales trend for toys has not been positive, the recent turnaround was driven by the release of Star Wars: The Force Awakens. Also featuring strongly were sales of Teenage Mutant Ninja Turtle toys. Now, sure, a lot of those toy sales would be gifts for kids. But I’d be willing to bet that a lot were also adult collectors. Could it be that adult fans of these retro properties are now such prolific toy buyers, they can affect national toy sales? …catering far too much to adult collectors and hanging on to the demographic that has nostalgia for this type of product, and they have not successfully courted children and brought them in. LEGO is another brand (and one that experienced a lot of growth in the 1980s) – that has cultivated a huge base of adult collectors and fans (known officially as AFOL – Adult Fans of Lego). They even manufacture some lines specifically for adults these days – witness their “Architecture Series”, which began in 2008. Some of their lines also have a distinctly “retro” look and feel to them too, which is something I have mentioned before. After all, a lot of the most valuable vintage LEGO sets today are the classic town and space sets from the 1980s. 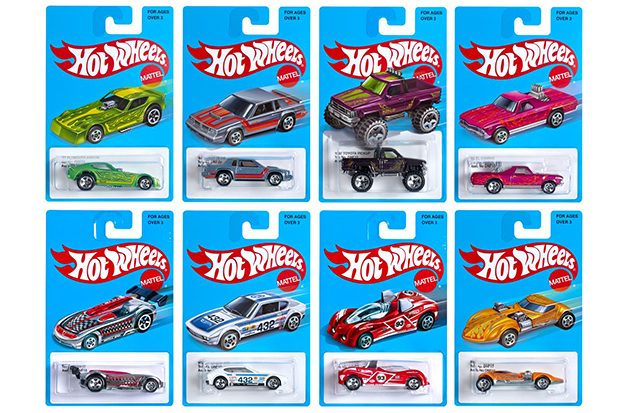 This week we had news that Hot Wheels is releasing some retro themed tracks, cars and playsets, and they sure seem like something geared toward the collector crowd. And of course as mentioned already, the R/C car industry has seen loads of remakes of classic kits from the 1980s. Tamiya has launched remakes of virtually every popular kit they ever made in the 1980s. Other companies are following suit. The remaking of these products can disrupt the values of original items for a while, by simply altering the balance of supply vs demand. But if you look at what is happening in the toy collecting world at large, dips in value are more aberrations, than long term trends. Original toys are the source of all the nostalgia in the first place, and they can never be replaced. I think in some way it is to do with the fact that we are seeing lots of retro favourites being reproduced and this has folk hankering after original playthings. I tend to agree. Remakes remind people of toys, brands and franchises they had forgotten. But ultimately, any revival of interest focuses attention on the historical significance of the original item. And if something was so great that it deserved to undergo a remake decades later, the original must have been pretty significant in some way. Are 1980s toys in particular demand these days? I think so. Of the retro lines we see in stores today, the majority of them were either launched – or hit their peak – in the 1980s. And of the vintage toys you often hear talked about as being valuable, 1980s toys are always in the mix – despite being relatively recent. Some have earned as much notoriety in just 3 decades, as the most collectible toys of any other decade. So why then, are 1980s toys in particular demand? Isn’t it just because the kids of the 1980s now have incomes and are in their prime age of consumption? The 1980s may have been the last great era of toys. The 1980s was the last era in which toys were mostly bought to be enjoyed, not collected. The 1980s featured a lot of toys that were of good quality. The 1980s happened right before the Internet. I can remember getting home after school in the mid-1980s, watching TV for a bit (often something like M.A.S.K. or Challenge of the Gobots), before heading outside to play before dinner. We only had 4 TV channels, so there wasn’t much to choose from. And sure, I had video games to play, and they were great fun, but they were also pretty simple – the limited gameplay variation of Attack of the Mutant Camels or Pit Stop on my Commodore 64 didn’t exactly take over my life. And of course there was no Internet, mobile phones, social media, 24 hour news/sport/gossip, X-Box, online multiplayer worlds, or any of the other things that distract kids today. Toys were hugely popular because they were still most kid’s #1 way to have fun. They were usually the main thing you wanted as gifts. They were sold in huge quantities, so much so that some toys were even known to trigger riots. Their peak popularity continued through the 1990s – for a while. But as I watched my niece and nephews grow up around the turn of the century, it was becoming apparently that kids were playing with toys a lot less, and were becoming far more obsessed with video games. Slot cars were raced until the tyres went hard, LEGO cities were built and destroyed over and over. Imaginations ran wild, and toys went with you everywhere – sandpits, holidays etc. Playsets were played with until all the little accessories were spread all over the house. R/C cars were driven through sand, snow, puddles, launched over jumps, and sent chasing after cats. Some of us looked after our toys more than others. But nothing was specifically preserved for the future. And ironically, it’s the very fullness of those experiences that gave us the great memories we cherish today, along with much of the desire to find mint/original examples of those toys. Most toys in the 1980s weren’t made in China. That’s not to say all toys made in China are bad. But let’s face it, a lot are. Today, almost everything is made in China. In the case of R/C cars, most of today’s ready-to-run R/C cars are a joke compared to the models from Japan and Singapore in the 1980s. Quality toys: Vintage Matchbox Voltron toys made in Japan are the ones you want – but be sure to avoid the ones manufactured in Taiwan as they contain lead. In the mid-1980s, Matchbox was struggling to fulfill demand for it’s line of Voltron toys, which were being made in Japan. So they decided to outsource some extra production to Taiwan. 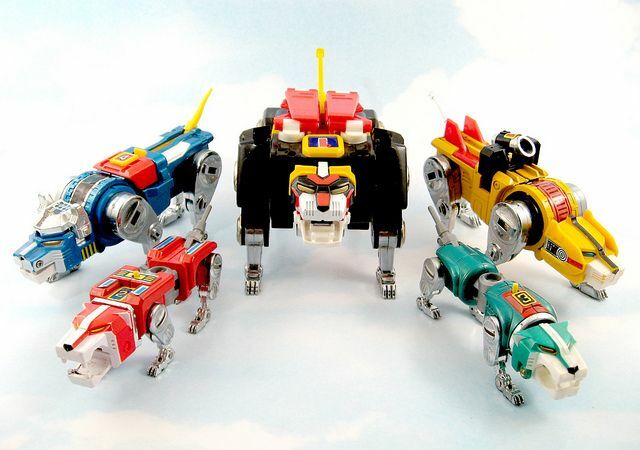 This was a bad idea, resulting in a little problem known as “Lead Peril Sparks Recall of Million Voltron Lion Toys”. To this day, collectors of Voltron toys need to keep any of those poisonous lead-tainted examples away from their own kids. But for the most part, toys in the 1980s were still being made in Japan or other countries with decent quality control, and have stood the test of time as a result. By contrast, today’s toys are a bit of a mixed bag, and it really depends on the toy company. LEGO always was (and continues to be) first-rate in quality, and you’ve also got to give Tamiya credit for still manufacturing many products in Japan (when every single R/C competitor has moved to China). But would you believe, the Chinese lead paint scandals in various other toys have actually continued, even in recent years. And there’s a certain unrelenting pressure on the toy industry to cut costs – and corners – that didn’t feel quite as offensive in the 1980s, as it does now. Hot of the heels of all the positives about toys in the 1980s, came the Internet in about 1995. This enabled humans, for the first time in history, to trade goods privately, on a truly global scale. And with all those kids of the 1980s hitting adulthood right when the Internet came along, and many of them noticing the disappearance of the toys they loved as children, suddenly you had a particularly acute level of motivation to buy, collect and try to preserve all that 1980s nostalgia. We are currently witnessing an unprecedented era of toy collecting. Remakes and revivals are everywhere. And there is a lot of nostalgia for the stuff from the 1960s, 70s and 80s. There’s a particularly heavy emphasis on the 1980s. And maybe this is due to the amount, popularity, and quality of the toys produced then, along with the number of original brands and ideas that hit their peak in that era. And despite all the sales of remakes and revivals, original vintage items will continue to be the crowning glory in any toy collection in the years ahead. And they will only become more highly prized as their numbers inevitably dwindle. That’s not to say popular toys from the 1990s and 2000s won’t also grow in collectability. But the nature of the toy boom of the 1980s suggests it may hold a special distinction, for some time to come. 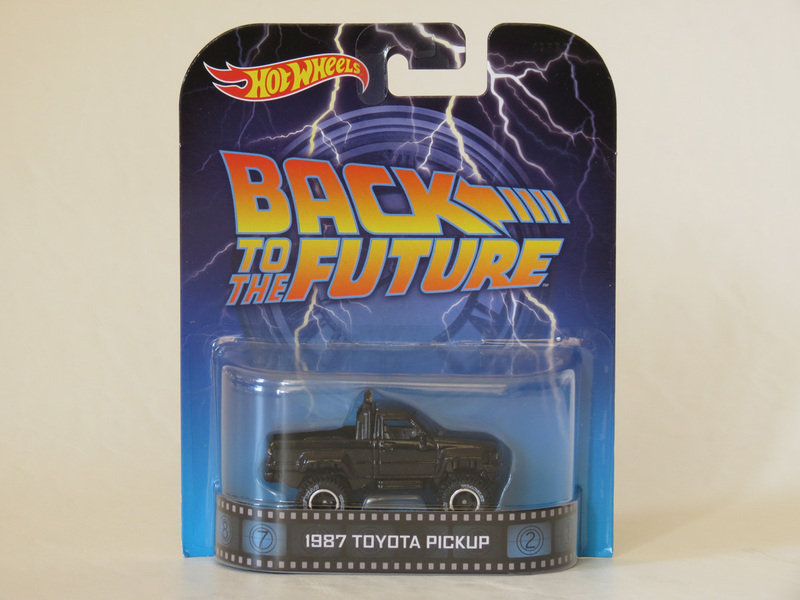 It’s a cool souvenir, and I don’t recall seeing Marty McFly’s 4×4 ever getting it’s own toy back in the actual 1980s. But it’s just a souvenir. A really nice one, but just a souvenir. It didn’t come out when the movie was made, nor when Back to the Future excitement was at it’s peak. It didn’t come out in the 1980s when it would have been something thousands (perhaps millions) of kids would have played with, because toys were the priority in life. In fact, I’ll probably never even take this one out of the packet. 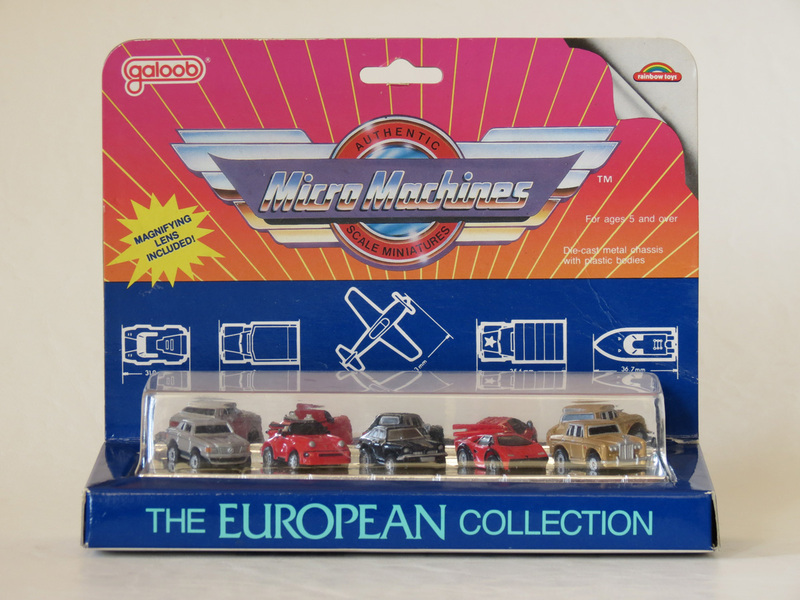 By contrast, back in 1986, Micro Machines were a hugely successful toy line that I adored and was desperate to own. They had great TV commercials featuring the motor-mouthed John Moschitta… remember these? Somehow these tiny cars tapped into the fads of the day – the idea of micro cars was super cool, and just about everyone I knew had them. 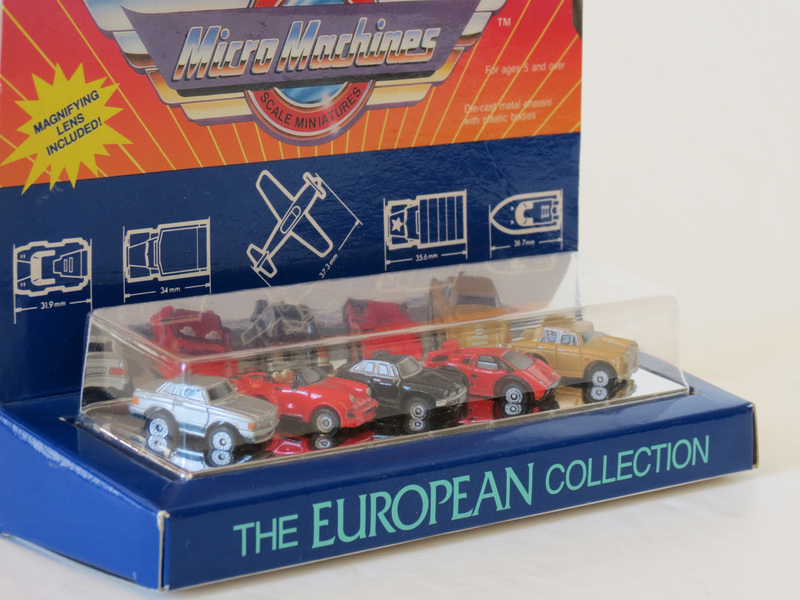 My family wasn’t wealthy, and since Micro Machines were popular they were also expensive. So I only received one set, called The European Collection. I can still remembering my Mum bringing it home one day after buying it at a service station during a long drive. I tore into the box so fast, and pored over the tiny printed car statistics on the card back – with the included magnifying lens! I don’t have to tell you which of these products – the new-retro item or the vintage-original item – means the most to me, or was the most satisfying to collect. I think there may have been a similar “toy boom” in the 50’s/60’s for all the baby boomers, but more with metal based toys done in huge volumes in Japan. I’m sure any toy robot collectors out there could elaborate. There was also a transition from clockwork to battery operated somewhere around there too. I too was a child of the 80s and will always enjoy my RC and AFX slot cars, plus a few other things I’ve managed hang on to from my childhood. As for those long gone, I’ve still got some fun memories! Thanks Dave, and there definitely was a boom in the 50s/60s as well. I wonder though, if it moved as much toy stock as the 80s boom? Appreciate your comments always, and glad you made it to the end of this article! (apologies as it turned out to be one of my longest ever). Thank you for another super entry! Your childhood routine mirrors mine except living in the country we only had the ABC, on holidays I could enjoy channels 7, 9 and 10! Wow, only one channel out in the country, I never knew that! That means you missed out on lots of morning cartoons as well, especially on Saturdays. I think a lot of the nostalgia with the 80’s is because the toys were sold alongside cartoons and tv shows, so you’d watch a cartoon and want the characters you see on the screen. Thundercats, Transformers, He-man, Star Wars, Go-Bots, the list is almost endless. It does help that the 80’s kids are now of an age with an income to relive their golden days though, I know I do!